The Shamu Lady Is Back! 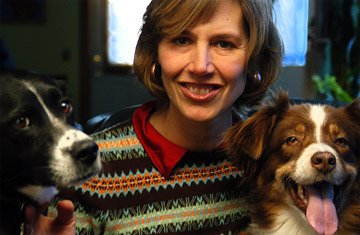 Amy Sutherland: The Shamu lady loves dogs, too. Does the name Amy Sutherland sound familiar? Perhaps in 2006 you were one of a gazillion people who were forwarded her personal essay "What Shamu Taught Me About a Happy Marriage," which ended up becoming the New York Times' most e-mailed article of the year. That story, born out of her experience working with students at a place she calls "the Harvard for exotic animal training," detailed the discovery that she could train her husband, Scott, just as she learned to train dolphins. Movie offers, television appearances and a barrage of emails followed, not to mention a book contract. Sutherland sat down with TIME to discuss her new book: What Shamu Taught Me About Life, Love and Marriage. TIME: How did you get in touch with the New York Times Modern Love column? SUTHERLAND: I just sent it in over the web! You can submit right over the web and it goes directly to the editor's inbox. At the time, I thought it was a long shot, but I thought, you know who else is writing about this? They get 10,000 submissions each year. The editor, David Jones, later told me he knew it was a keeper. Oh God, yes. The first thing that happened that morning is the BBC called me. They called me at 10 o'clock and I thought, "What's up with this?" Then I saw that it was on the Top 10 list. On Monday, I started getting e-mails from movie producers, the Today Show. I just sat at my desk going, "Oh my God!" I just wanted it to be in the New York Times! I would have been perfectly happy with that. And then it hit number one and it just stayed there. Why do you think people reacted so strongly? Well, one thing about my column that I think jumped out at people is that there's not too much humor in the Modern Love column, typically, and there's not too much humor in The New York Times. So it sort of jumped off the page in that respect. And as much as I love The New York Times, it doesn't give you a real sense of everyday life. Have any of your girlfriends tried these techniques in their relationships? I have two in particular who I know have at least thought about it. We talk and "shamu" it. If they're having a problem, we sort of break it down. It makes for more interesting conversation: how many times have you talked with your friends and it's just moaning and complaining? And you know, that's justified. But with these techniques, it becomes more of a creative discussion to come up with solutions. Would you categorize this as a self-help book? I don't know how quite to categorize it. My fast way to describe it is a "quirky, personal memoir." Because, to me  and I tried to write it this way  you could read it in a variety of ways. You could read it and just have it be funny. You could read it and learn about animals and animal behavior and training. You could read it and just get some general food for thought, like philosophy. Or you could really look toward specific ideas to improve relationships. In the book, you talk about the "inner primate." What's that? I first heard it from Gary Wilson, a teacher at the school. And he just means that we're really aware of hierarchy and rank. We don't like to be pushed around. On the flip side, we like to push around. Trainers have to really fight that urge because their relationship with their animals should always be cooperative. They're not trying to get them to do anything as a reflection of the trainer's ego or to just show that they're in charge. You really have to drop that whole "who's in charge of what." What kind of backlash have you experienced? People often talk about how it's not right to manipulate other people's behavior, but it's already going on. So why not be more conscious and more productive about it? This is about using rewards instead of trying to change people's behavior by punishing them, or yelling at them or snapping at them. Another enormously popular animal trainer is "Dog Whisperer" Cesar Millan. How does your approach differ from his? I've watched his show a number of times, and a lot of his techniques are very similar to this. The only difference is that he puts a lot more emphasis on dominance than any of the other trainers I've worked with or followed. And these are trainers who were working with killer whales and other really big, dangerous animals. So, if they can train complicated behaviors without using dominance, it seems to me that you wouldn't need to with dogs. What did you think of the recent tiger attack at the San Francisco Zoo? I was obsessed with that story. There was a lot of great coverage of that, but one idea, which was very anthropomorphic, was that [the victims] made the tiger mad and that's why the tiger jumped. A tiger is really not likely to jump just because it's mad. They did something to make that tiger think they were prey. So they either got on the fence, or jumped over the fence, or did something with their behavior to make that tiger think "dinner," and all the switches go on  the rush of adrenaline in those animals is incredible. Some animal-rights activists, even members of the general public, have a very negative perception of zoos. Well, some of that is from a misunderstanding of how zoos operate, or what the animals need. We equate an enclosure with prison, and it's a very anthropomorphic way of looking at the animals. And one of the cool things that they've done with training is that they now use training not only to take care of the animals in the zoo, but use it for stimulation and for exercise. So if a zoo trains an elephant to do what to some people might look like tricks, the thing is, those tricks are like calisthenics, it's like physical and mental exercise. That's fundamentally good for the elephant. Maureen Dowd wrote a column in response to yours in which she draws a parallel between your approach to relationships and technology's effect on society and relationships. What did you think about that? People are always saying, "Aren't people more complicated than animals?" And we are. But one of the things that animals totally have over us is that they pay attention. We're always noodling around. We say things we don't mean because we're not paying attention. We miss things because we're thinking about what we're going to have for dinner. Animals can't afford that. They're right in the moment. I hate to use that New Age-y term, but they really are. And new technology is certainly providing a lot more ways to be extremely distracted. Sometimes I wish a dinosaur would come back. I think we'd all pay attention a lot more if life weren't so easy for us. What do you think about people's need to be affectionate with animals, like the moment in your book when you bear-hugged a dolphin? I think we have a longing to be part of the web of life, and animals remind us of that. I mean, that's part of why we have pets, I think, it sort of pulls us back into that broader web. For me, that was the real magic of the book and learning the training  because the way these principles worked with every species, including us, made me feel like, "See? We are part of it." Because we think of ourselves as this invasive species, but we're not. I mean, we behave like that. But we're not. We really are part of everything. How was this experience different from other stories you've worked on? So many things were a surprise about this whole experience. I'm a journalist. I like to live vicariously through all these stories, but I was always just a removed observer. And I found that this experience of being at that zoo and around those animals had this transformative effect that I describe in the book, but the other thing that happened to me that's not in the book is that I have never really been able to go back to a normal life. I miss all that animal contact. It opened a door in me that I have not been able to close. I don't know what to do about that. It's like I need a fix almost. What do you think then of people who don't like animals? I try not to think bad things about them. [laughs ] But I find those people very rarely. What are some of the more bizarre questions you've been asked by readers? Well, I did get some really weird e-mail questions when the column came out. I had a woman who  I didn't know if she was kidding or not  but she e-mailed me that her boyfriend would pop the pimples on her face [laughs] ... and how could she get him to stop. I wrote: "I would break up with him!" I was just like, "Move! Move away!" I hope that one was made up. People often ask me things with their kids  and I definitely have ideas  but I don't have my own kids so I don't have firsthand experience. But if you did have kids, you'd be applying these techniques? Oh yeah! Yeah, yeah, yeah. Definitely. The biggest thing they showed me is how easily and unintentionally you can encourage behavior you don't want by giving it attention. I have friends who have basically trained their kids to whine by always responding to it. Or the classic is that kids don't get any attention when they're behaving nicely, and then the moment they're not, they get a ton of attention.